The prompt over at National Blog Posting Month for Monday was: How would your life change if you didn’t have rent or a mortgage to pay, i.e., if your housing was free? HA! Well, I’d be freer to travel wherever I’d like to go, that’s for sure. Really, I don’t need much and that’s one thing I love. Oh, and I’d buy a Mamiya digital with all the bells and whistles. So my life would change by being even more well traveled and having a really amazing camera. Oh, and I’d donate way more. So maybe my life would change (good karma) by helping someone financially. For today: Tell us the story of a piece of jewelry you own. Where did it come from, and what does it mean to you? 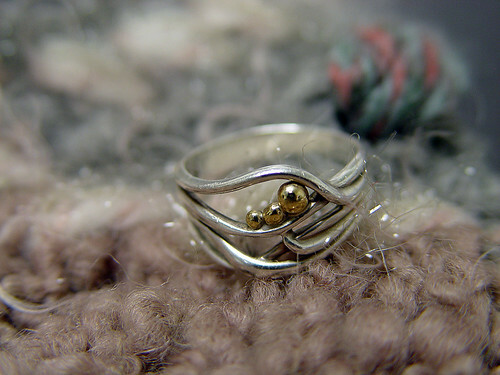 Well, I’m going to tell you about three pieces, cause they’re my favorite rings. This one I bought a few years ago at a silversmith booth at a craft fair near my cousin’s house and when I saw it I thought of my (then) little family of three (me, Wolf, Max). Pat, who I met in 9th grade and is still my friend today, LOVES this ring and so 1) I always look for this silversmith at any craft fair I go to hoping to find one for her so that 2) I don’t have to give it to her when I die LMAO! The one on my middle finger is an Elvish wedding band I bought in a gift shop in Edinburgh at the height of my Lord of the Rings obsession! 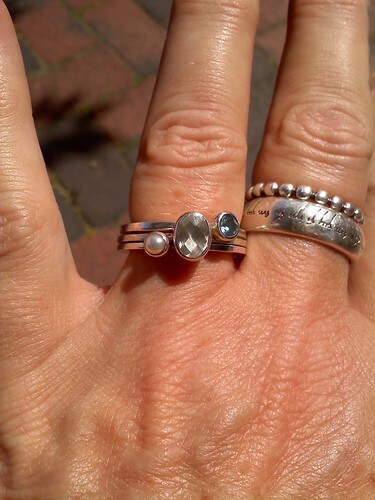 The three gems are what Dave bought me for my birthday this past June down in Provincetown, MA. The top one is blue topaz, his birthstone; the middle one is moonstone, which has a special meaning for us; the bottom one is my birthstone, a pearl. I wear it on the finger most folks wear a wedding ring, because even though we’re not legally married…we both feel so committed to each other it just felt like the logical finger to wear it on.